A yoga studio needs to be functional: ample floor space for rows of mats, good acoustics, easy-to-clean finishes, etc. But in this genre, functional also entails inspiring peace, calm, and focus. Which is easier said than done when the location is New York City—not exactly the epicenter of serenity—and the site is the 4,157-square-foot former Chelsea home of Tekserve, a tech-support shop much missed but hardly remembered as a refuge from stress. Christopher Boots’s pendant hangs in the lobby, above chairs, a rug, and a marble aggregate table, all from CB2. Photography by Joseph Shubin. 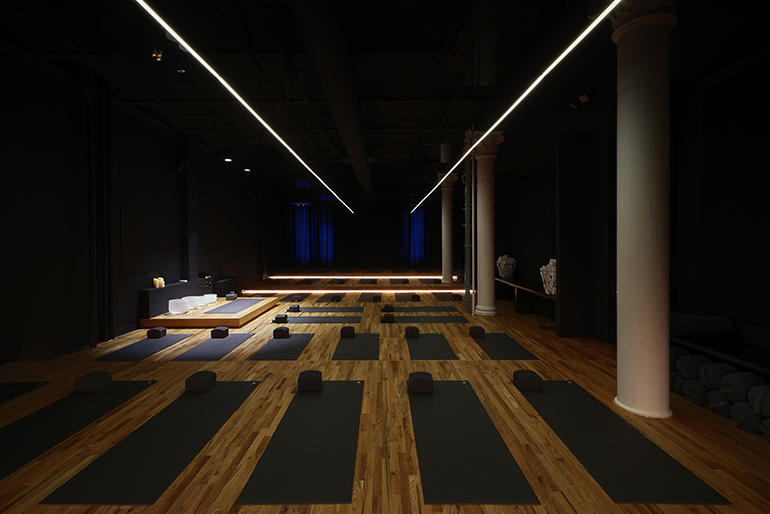 The studio in question is the first U.S. outpost of Humming Puppy, an Australia-born brand named for a device that emits “humming” sound waves to assist in meditation during yoga classes. Melbourne-based lead designer Karen Abernethy and Brooklyn’s Mesarch Studio collaborated on the interiors. 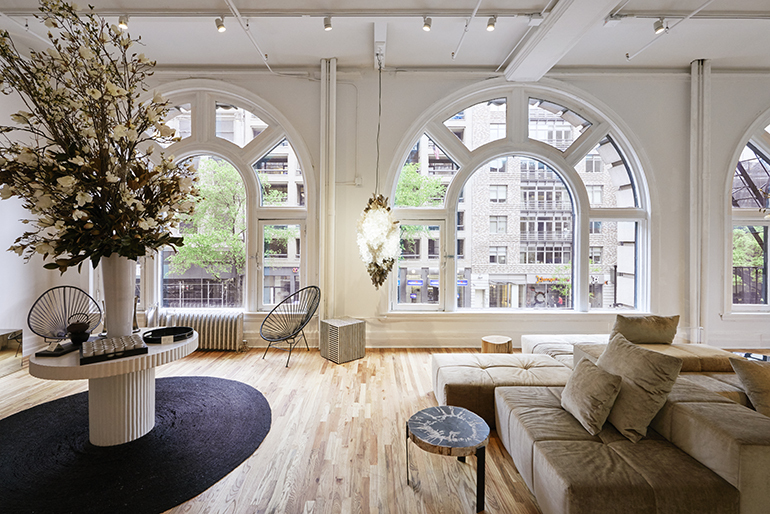 “We wanted the design to accentuate the features of the iconic space: steel Corinthian columns, arched windows on the street frontage, and high ceilings with five-foot vaults,” Abernethy says. The team honored those elements by choosing a neutral palette and natural materials for the lobby reception area. Bartco Lighting provides both illumination and wayfinding in the shala. Photography by Joseph Shubin. The studio itself, she continues, “is completely contained within what appears to be a floating mirrored volume.” Other spaces are delineated with expanses of “floating curtains,” she explains, for a design as flexible as its users.